The Wine Cave Company are a new business in the UK supplying and fitting an original concept that combines the advantages of the traditional wine cellar and the wine cabinet. The wine cave is fitted into the floor and rises up on the push of a button bringing the cellar to you. We started from scratch on this project building a full brand design, logo, business stationary, brochures and leaflets as well as the website. The quality high end product needed a professional, classy website to match the brand. 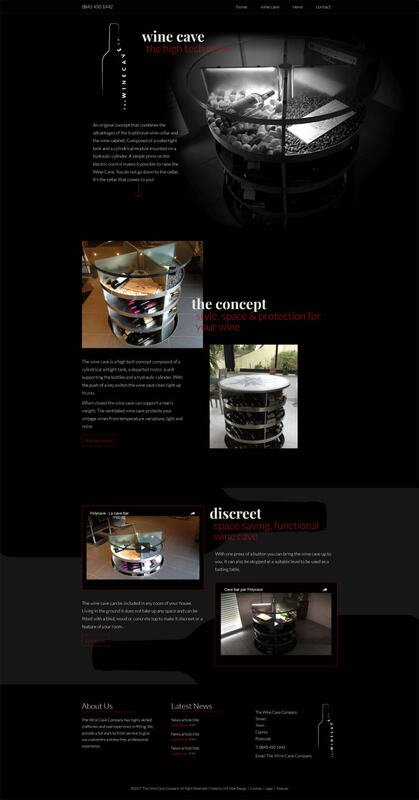 JKE put together a design incorporating the features of the product with an attractive design that promotes the product and allows The Wine Cave Company to post news updates of their latest product information and events. We used a lot of animation to give the impact required and made the logo rise up just like the product does. Colours and fonts were all carefully matched to pull everything together and align with all the other branded stationary and brochure designs. 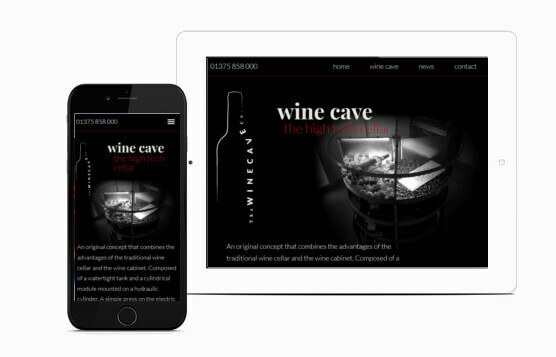 A fully responsive design that steps away from the normal corporate layout to give a classy, modern look for The Wine Cave Company.